From 1" to 6" in a wide range of material options, TODO-MATIC® Dry-Break® couplings offer advanced fluid handling solutions for a diverse range of industries. Major offshore exploration, chemical, pharmaceutical and petro chemical companies rely on TODO-MATIC® couplings to safely transfer their most aggressive or valuable products. Designed for safe and easy use with minimum operator intervention. 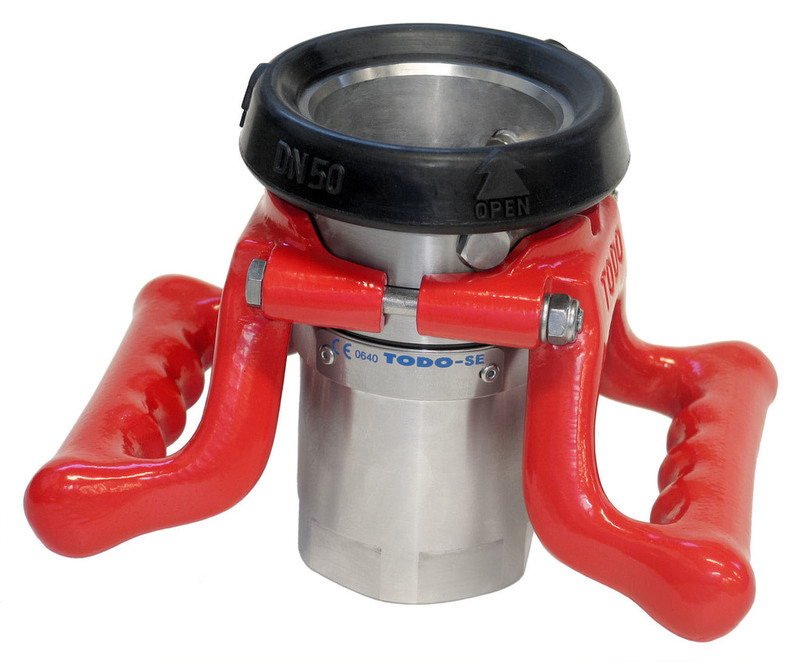 TODO­MATIC® couplings offer an unbeatable combination of technical, safety and performance features. • ISO retrofit and new build. • Ship to shore/ ship/ rig transfer. • Valves open and close automatically on connection and disconnection. • Simple single action operation, no levers or switches to operate. • Valves are guaranteed closed prior to disconnection. • Will connect and disconnect under pressure and flow where necessary. • Extremely reliable, very few moving parts. • Robust construction, no external operational components. • Reduces spillages to virtually zero. • Dramatically improves both operational and fugitive emission performance. • Reduces the possibility of human error in transfer operations. Kiowa are now able to offer our customers not only the full range of TODO Dry-Break Couplings and accessories but two UK TODO service centres for the Dry-Break Couplings. We can repair and replace the internal seals and parts as required and re-pressure test them ready for use, with a test certificate being issued if required. With Kiowa you are NOW available to buy online with volume price breaks, your agreed discounts and your special net prices being displayed online whenever you log on. If you don’t have a web account that ties in with your business account with us, then please contact us. Etching – We can etch your information onto the couplings using Dot Pin marking. The information can include serial number, purchase order number or detailed information such as CIP.